Mexico's Gulf of California has been hit by a "strong" earthquake, according to the US National Earthquake Information Center. There have been no reports of injuries or damage. The 6.9-magnitude tremor struck at 1259 local time (1759GMT), and its epicentre was 76 miles (122km) north-north-east of Santa Isabel in Baja California. There was a risk of a small, localized tsunami in the area, officials and experts warned. Four earthquakes, the strongest registering a powerful 6.9 magnitude, struck near the coast of Baja California. The series of quakes began with a 5.8-magnitude tremor at 1755 GMT, followed by one registering a magnitude of 6.9 at 1800 GMT. Another of 5.0 magnitude struck at 1833 GMT and a fourth of 5.9 magnitude followed at 1840 GMT, according to the U.S. Geological Survey. More information on Baja Explorer Authorities said Monday there was no tsunami threat to the West Coast and Hawaii following a strong earthquake beneath Mexico's Gulf of California. The temblor, which had a preliminary magnitude of 6.9, struck the Gulf shortly before 11 a.m. Five minutes earlier, a foreshock registering a magnitude-5.8 hit the region, said geophysicist Paul Caruso of the U.S. Geological Survey in Boulder, Colo. The main shock was followed half an hour later by two moderate aftershocks with magnitudes of 5.0 and 5.9, according to the USGS Web site. Three of the epicenters were under the Gulf waters between the Baja California peninsula and the Mexico mainland. One epicenter was near the peninsula's eastern coastline. The West Coast & Alaska Tsunami Warning Center and Pacific Tsunami Warning Center said no destructive tsunami was expected along the West Coast and Hawaii. 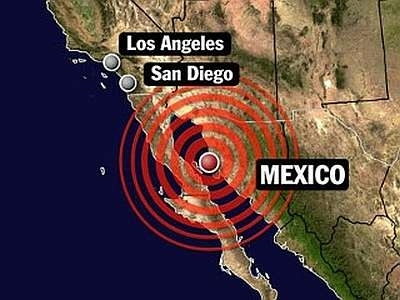 The quakes were centered between 297 miles and 343 miles south of the California-Mexico border at the boundary where the Pacific and North American plates are pulling apart, said Joann Stock, professor of geology and geophysics at the California Institute of Technology. Today’s quake was the largest in North America, excluding Alaska, since a 7.2 temblor struck off the coast of California on June 15, 2005, said Erik Pounders, a geologist with the USGS in Pasadena, California. More recently, a 7.2 quake struck Alaska’s Aleutian Islands on Dec. 19, 2007.